The Windows version (patched to 1.1 by GOG.com) can support high resolutions like 1920x1080 with a tweak. Even the DOS version can go as high as 1024x768. The Windows version has issues on modern systems. The DOS version (on the same CD or sold separately) works perfectly in DOSBox. Retail version requires the CD to uninstall the game. Disc check (see Run without the CD). Do a full install of the game. Copy the CD contents to a new folder. Edit the configuration file (afterdos.ini for DOS version, alife.ini for Windows version). Change the CD Path line to point to the CD folder. Save your changes and close the file. The game will now run without the CD. 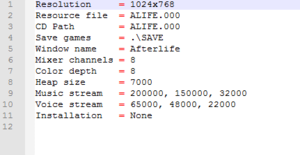 INI Settings for Afterlife, found in ALIFE.INI. Afterlife running at its maximum observed framerate of 70 FPS. 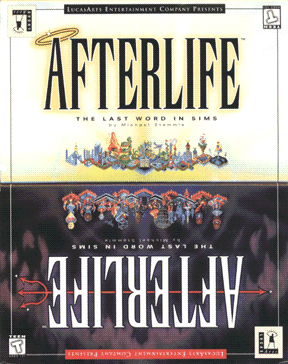 An example of Afterlife (Win9x version) running in a 1080p borderless window. (Windows 9x Version only) Change resolution in ALIFE.INI. DOSBox version crashes on widescreen resolutions and anything higher than 1024x768. 2880x2160 has not been tested. DOSBox version cannot go above 1024x768. Windows 9x version only. Borderless Gaming for DOSBox doesn't stretch the game window. 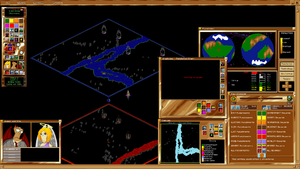 70 FPS cap observed with DOS version. See screenshot on right. In some cases, it is possible to emulate a mouse using a gamepad and external program. Options can only be found in-game, on the toolbar at the top of the screen. The intro has no subtitles. Under Windows 7 64-bit, the tutorial window appears but nothing else. Any user input will show a dialog box saying the tutorial was completed. To fix this, set the 'compatibility mode' to 'Windows 95' in compatibility settings of the exe. iMuse Used to procedurally generate music based on events and what is being viewed on screen. Can create some issues on 8-bit sound cards. ↑ 2.0 2.1 File/folder structure within this directory reflects the path(s) listed for Windows and/or Steam game data (use Wine regedit to access Windows registry paths). Games with Steam Cloud support may store data in ~/.steam/steam/userdata/<user-id>/557240/ in addition to or instead of this directory. The app ID (557240) may differ in some cases. Treat backslashes as forward slashes. See the glossary page for details. This page was last edited on 10 April 2019, at 04:37.